Have we mentioned how much we love this weather! Grow veggies grow! You may have noticed we’ve been irrigating, even though we had six inches of rain last Saturday. Some of that downpour just ran off above ground and made its way to the Cannon, some went into your veggies present and future, and the rest went down through our light soil and gravely subsoil, and up in the hot sun. So by Tuesday we were adding water to the “recipe” again, trying to germinate tiny carrot seeds, and keep broccoli and kale plants healthy and happy in the heat. Rain is nice, and six inches in four hours did save us some work hauling pipes around the farm (so we could weed instead), but moderation is welcome. There was more ponding than we’d like to see, but after walking the farm it was clear that the soil erosion and crop damage would have been much worse without the retention basin and waterways we put in this year. There are more minor improvements to make, but it was good to see relatively little damage from such a storm, just in case it is the new normal. It’s been dreamy to be picking blueberries in Northfield! (Well, for us it’s even right next door…..) Our friends Aaron and Molly Wills have grown some incredibly tasty blues, and will be open for picking this week and on into August. Visit LittleHillBerryFarm.com for picking times and pricing, and click here to subscribe to their email list. Their driveway is the second driveway west of ours, and when you’re driving up you get a nice view of our back field on the right. This week on the farm we’re still planting (greens, lettuce and soon spinach and kale for the fall), and the great joyful garlic harvest, but our biggest focus is still keeping the weeds at bay. We’ve got a wonderful crew who pulls and pulls and pulls, and the end is in sight! Well, it’s more like we’ll be over the biggest hump in a couple weeks, just in time for tomatoes to strengthen our backs and fill our bellies. The tractors are still out getting all the weeds they can, and have been discing down the remains of much of what we’ve all been eating in recent weeks– the spinach and first broccoli planting, plus the first lettuce and greens, and radishes, kohlrabi etc– those beds are all ready to be planted into a soil-feeding cover crop. For the cover crop, we’ll plant a number of different plants, since diversity so often saves our ship. This weekend we put in small sections of a mix of oats or sorghum, buckwheat, clover and grass. The oats and sorghum make the most biomass and occupy the ecological niche of other unwanted grasses; the buckwheat also adds biomass, plus scavenges phosphorus for the next crop, and the flowers feed the bees and parasitic wasps and flies to help protect those late plantings of broccoli, cabbage and kale; and the clover and grass, if they germinate in summer heat, can hold the soil over winter and put on lush green growth in early spring. We like what we do. We like seeing your smiling faces every week, and that you’re willing to share the risks and rewards of farming with us, so that we can stay on this lovely piece of bountiful Earth and grow food for you for the years to come. We’ve got a good thing going, so thank you! May your days be sunny and green! This is the time of waiting patiently for the luscious fruits to ripen and come in — tomatoes, peppers, eggplants and melons are on our minds, but we won’t be swimming in them for a couple weeks yet. Tomatoes and Asian eggplant should trickle in this week, but peppers won’t trickle until next week at the very earliest. All these look stellar right now; they have loved this mild sunny summer. They do have mild signs of plant pathogens, and as always extended cool rainy weather could exacerbate that. At this point we’ve done pretty much everything we can –from cover crops and compost to minerals and proper watering (oh yeah, cultivating and weeding too)– to help them be strong and healthy, so we’ll mostly watch and learn. For melons, they got off to a very slow start with the cool weather way back in early June but have finally snapped out of it — the cantelopes look great, and the watermelons look healthy but less vigorous. ETA is mid-August. They’re both growing and setting fruit– the first ones are softball sized right now, and they’re still making more. Like the other fruiting crops, melons are visible when the flower falls off and they’re not even as “big” as a pencil eraser. Especially when you think of a huge round watermelon, it really makes a peeking farmer go “Aaaaaaaawwwwwwww.” The vines are covered with tiny yellow flowers, and the bees, wasps and flies are zooming in and out putting the pieces together. 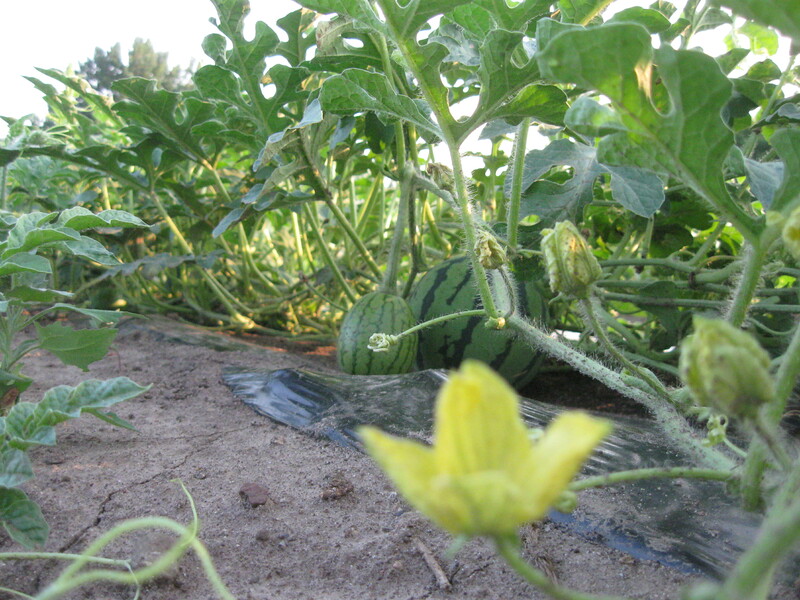 The picture above is a farmer’s eye view of the melon patch. In addition to all we’ve had lately, this week we’ll have sweet onions and fennel. Baby leeks are done, we’ll do more next year. Scallions are getting overgrown from the heat and age, and besides, with sweet onions in the kitchen we can’t think of anything else. They go in everything right now, and they add so much soft, subtle sweetness! We should have them for 2-3 more weeks, and sometime after that we’ll be picking storage onions, which have more sulfur and are more pungent. Hopefully they size up, they’ve got a lot of growing to do! They look ten times healthier than last year’s disease, heat, and deluge-stressed onions. This weather rocks. The Peas did not like those hot hot days. It makes them all ripen double-fast, and even though it seemed like you all picked lots, they yielded very heavily and it’s hard to get them all. Now we’re down to gleaning (aka scrounging), and even that might be futile by the end of the week. Green beans are still going. You all are a good crop of bean pickers! We had a little gap last week but it looks like very soon we’ll have another flush. For herbs: cilantro, basil, dill, parsley, oregano, thyme, cutting celery, and marjoram. Cutting celery makes for awesome soups (we just used it in cream of broccoli), just cut a few stems, chop it fine, and add it near the end of cooking. We like having this all summer for that celery flavor, until the heads/stalks are ready in late August, and then celeriac (celery root) after that. We’ve been wanting a flower year like this! We hope you enjoy them too! Friday say Hi to Veronika — For you Friday folks, crew member Veronika will be serving you in the shareroom this week, as we are planning to head north to jump in the big lake and see some family for the weekend. As always please make sure your needs are met, she’ll be happy to help you, whether it’s about finding the beans, or needing some more kale in the basket, etc. 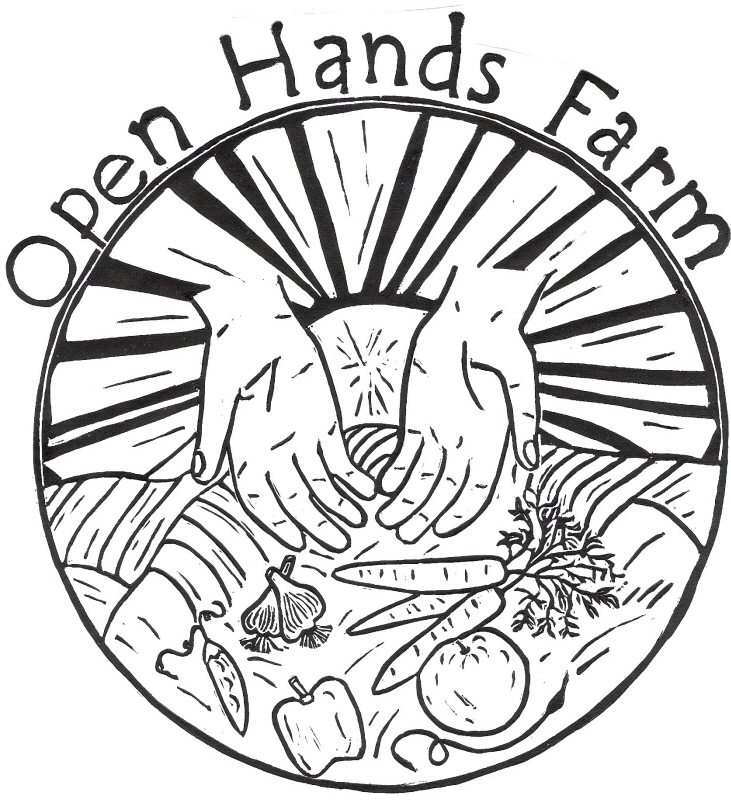 Farm Potluck Saturday, August 10th. Save the Date! Farm tour at 4:30, Potluck Dinner at 5:30. (Toddler schedule.) More details next newsletter. Check out the new reusable produce bags –if you haven’t already. If you’ve bought some, keep us posted on how they’re working for you, and how you’re using them. Raspberry Bug Update — The insect pressure on the farm continues to be low, with one notable exception. That pesky and new-to- America fruit fly, Spotted Wing Drosophila (or SWD), is back. We’ve been finding it in our wild patches of black and red raspberries. Soooooo, we’ve got raspberries growing, likely to ripen in mid to late August, but who knows if any of them will be bug-free. We know it doesn’t bother some of you when the larvae are in there, since they go unnoticed unless you go looking for them. But for some, it is a game-changer and makes them unpalatable. We understand this can be hard. It is so hard to see these beautiful fruits be ruined by those pesky bugs. The organic management options are a couple gentle and/or biological sprays. These need to be applied once or twice a week and even then they might not help. At this point we are choosing not to spray. We’ve only sprayed one pesticide on the farm, for late blight in tomatoes last year, and we’re in no rush to do any more spraying. (Aside from the probiotic culture we’ve been using on the plants.) There is some concern about inadvertently harming beneficial insect populations, and also sprays aren’t cheap. We grow fall raspberries for their reputation as low maintenance and long-lived, and therefore they fit (just barely) within the price of your farm share. As fantastic as raspberries are, it is hard for us to justify putting put more money and time into them. So with those reservations, we probably won’t spray and we’ll see what happens. We may have to reframe our thinking and see fall raspberries as a “bonus” crop if there is ever a bug free year. We looked into trying to treat our fall-bearing varieties as summer bearing, but it turns out it won’t work for our varieties in our climate. Our raspberries are still weeks away, but we thought we’d give you advance notice. We’ll keep you posted, and let us know what you think. Carrot non-sequitur — We are head over heels in love with those juicy, sweet, crunchy and gorgeously orange carrots. Blueberries next door! If you would like to receive notification of picking times click here to subscribe to the Little Hill Berry Farm email list. Peel and slice the onion and put in on to stew in the butter over low heat, covered. Peel the carrots and potatoes and cut them in large chunks. Once the onions are fairly soft, add the carrots and potatoes, salt generously, and continue to stew, covered, for about 10 minutes more. Add chicken stock to cover and simmer until the vegetables are entirely cooked. Take the pot off the heat. Reserve a handful of cilantro leaves for salsa and throw the rest of the cilantro into the soup pot. Purée the soup in a blender or food processor (or pass through a food mill), and strain through a medium sieve. Adjust the seasoning with salt and pepper. Make a little salsa to your taste with the onion and jalapeño peppers, chopped; the lime juice; and the reserved coriander leaves, coarsely chopped. To serve the soup, bring back to a simmer, ladle into bowls, and garnish with the salsa. Combine the cabbages and onion in a large bowl. Mix the sugar, buttermilk, mayonnaise, and lemon juice in a small bowl until smooth. Pour the buttermilk mixture over the vegetable mixture and toss to coat thoroughly. Fold in the cranberries, pistachios, and clementines. Season with salt and pepper. Let stand for at least 1 hour, or refrigerate for up to 8 hours, before serving. Taste and adjust the salt and pepper just before serving. Kitchen Note: Red cranberries and green pistachios give this salad great color, but other dried fruits and nuts will work just as well.